Thoughts on improbable fruits by Kathie Hodge. That’s me. Only fools try to identify fungi over the phone. I once got a call about chaga (a sterile conk that is the life’s work of the fungus Inonotus obliquus), and I said “it’s pretty unmistakable…” only to later receive a photo of something quite other. And mushrooms implicated in poisonings are notoriously tricky to ID by phone, because one is prone to mislead oneself, and also to plant ideas in the caller’s head that turn out to be untrue. Bill Bakaitis wrote a thoughtul essay about this. But a while ago I got an email about shrubs sporting fruits of papier mache, and I dared to venture a guess. Late on a Friday afternoon I had the feeling so eloquently expressed by our cryptic Friday Afternoon Mycologist: a feeling of idle, end-of-the-week curiosity. So I drove right out there after work and had a look at those azaleas. This Azalea–the Pinxter Bloom, Rhododendron periclymenoides— is uncommon around Ithaca but grows like a slosh of pink paint splashed southward down the eastern mountains of the US. Like other rhododendrons, it’s susceptible to a fabulous gall-forming fungus, Exobasidium vaccinii. No really, fabulous as in “if you’re growing rhodies, you’ll want this too.” The galls, also called Azalea apples, are said to be edible (but read on!). They’re mostly plant tissue, with a dash of fungus, and they’re big and juicy and a little sweet. There are more than one hundred species of Exobasidium, all of them plant pathogens, and all finicky in which plant they’ll eat. Most modify some part of their hosts by altering the plant’s hormone levels. 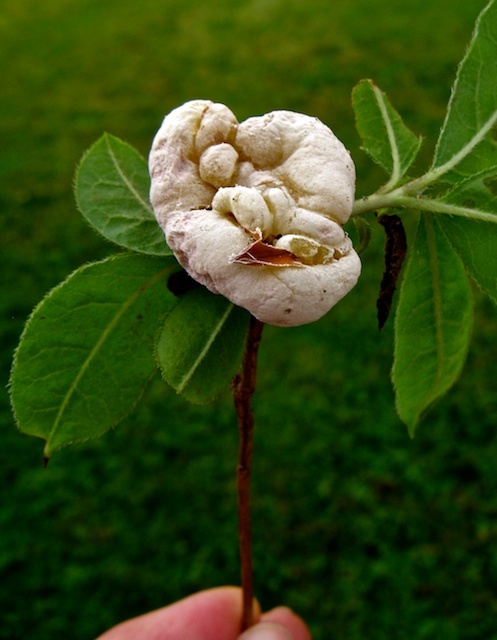 This gall is made of azalea cells that have been tricked into growing an “apple.” The white surface of the gall is busy with fungus, and the fungus, Exobasidium vaccinii, is busy making a ton of spores. It makes banana-shaped basidiospores which in turn can sprout pointy little asexual spores. Either kind can blow or splash away to start infections in growing branch tips. They won’t blossom into full-blown galls til next Spring. Knowing their life cycle suggests a way to deal with them: snip off the incipient galls in springtime, before they produce spores. Though I’ve heard of people eating these pinxter apples, azaleas and rhododendrons are poisonous plants. Their grayanotoxins mess up sodium channel functioning, and therefore your nervous system–nerves can’t turn on and off when they should. Most notoriously, grayanotoxins are concentrated in “mad honey” made by bees who visit Rhododendron flowers. Those who eat much mad honey become strangely intoxicated, dizzy, they conk out, and have slow and funky heartbeats for a day or more. Livestock may perish, but people seldom die from grayanotoxins. Well, unless you count that time when Pompey the Great’s soldiers were slain by their enemies while zonked on mad honey that had been sneakily left for them by allies of Mithradates VI. That was back in 67 B.C. : perhaps the first instance of biological warfare. Adrienne Mayor wrote a fascinating article about mad honey, and Stephen M. Henning presents some tales and lore about rhododendron poisoning. All this is to say, don’t eat Azaleas or Rhododendrons, or their galls. Confessional: I said you’ll want these in your garden, but perhaps you don’t know me very well. Being a plant pathologist/mycologist, I look fondly on all sorts of blights, specks, spots, wilts, and galls. When I learned that horrifying masses of orange goo washing up on Alaska’s shores turned out to be fungus, I thought: Woo hoo! it’s about time a fungus that normally toils in obscurity got its 15 minutes of fame. So. We may not be of the same mind, you and I.
B.D. Compton. 1995. “Ghost’s ears” (Exobasidium sp. affin. vaccinii) and fool’s huckleberries (Menziesia ferruginea Smith): a unique report of mycophagy on the central and north coasts of British Columbia. J. Ethnobiol. 15(1): 89-98. [700kB PDF]. Read this, it’s great. Bill Cline. 2011. Exobasidium fruit and leaf spot. NC Blueberry Journal. S.A. Jansen, I. Kleerekooper, Z.L. Hofman, I.F. Kappen, A. Stary-Weinzinger, M.A. van der Heyden. 2012. Grayanotoxin poisoning: ‘mad honey disease’ and beyond. Cardiovasc Toxicol. 2012 Sep;12(3):208-15. doi: 10.1007/s12012-012-9162-2. Free access via PubMed Central. Adrienne Mayor. 1995. Mad Honey! Bees and the Baneful Rhododendron. Archaeology Magazine 48(6): 32-40. [a charming article about mad honey over the ages]. Images: Kathie T Hodge (Gall on Rhododendron pericylmenoides); E.A. 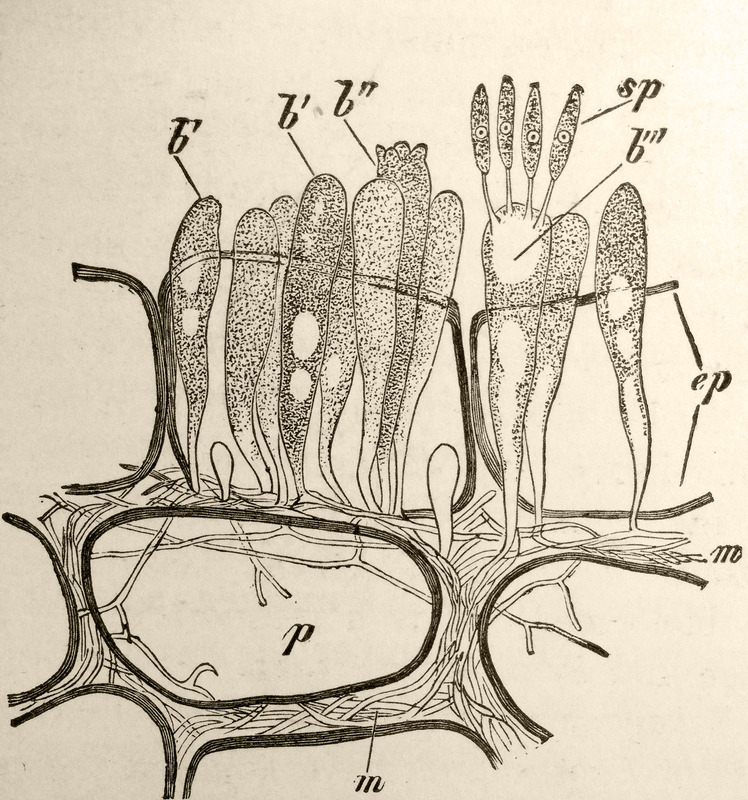 Gäumann (from his clasic book Comparative Morphology of Fungi, 1928). Flickr photographer BlueRidgeKitties took a particularly nice photo of this disease. Wouldn’t the lovely pairing of azalea flowers and cheerful galls perk up your garden! Thank you, Sandy P., for asking me about this in the first place.